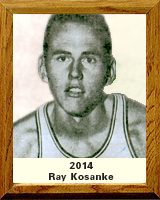 Ray Kosanke, nicknamed “Big Ko” during his playing years at Tucson High, led the Badgers to an undefeated basketball season in 1962 and the State Championship. He was named to the All-City and All-State teams and was a Dell Magazine High School All-American. He was an Honor Student and in the National Honor Society. He was one of five boys from Tucson elected to the 15th Annual Boys State in 1961. In track during the 1962 state championship Kosanke came in second in the discus throw, setting a Tucson High School record. He was also the Student Body President of Tucson High that year and in addition was elected Youth Governor for the State of Arizona in the Arizona YMCA’s Youth and Government Program. He traveled to Washington D.C. representing the state and met then President John F. Kennedy with the youth governors from the other states. Kosanke went on to play basketball for Stanford University and was Co-Captain his senior year. From there he went to Europe and played for a Belgian team that won its division both years he played. While there he coached both the boys’ team and the men’s team. In addition to his undergraduate degree from Stanford University, he later earned an MBA from Pepperdine University. Kosanke and his wife, Daniele, have been married for 44 years; have 3 children and 14 grandchildren, four of them adopted.